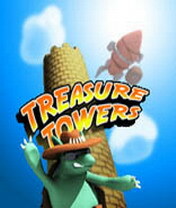 Treasure Towers 3D (by Sony Ericsson) — Mobers.ORG — Your Daily Source For Mobile FUN! You’re an Indiana Jones-like lizard jumping on a pogo-stick on the inside of a cylindric 3D tower. The view is gorgeous and you could have fun just jumping around, but you actually have to hurry and find your way to the top, ’cause the tower is slowly filling with water – and you wouldn’t want to drown, right? The controls are very easy to master – left, right, up will allow high jumps(but can’t be combined with horizontal ones), down will let you duck and roll through small gates, and down in mid-air will trigger a hard-fall that can break the breakable stone blocks. On your way to the top you’ll have to be careful to special blocks – yellow ones are extended/contracted by special “key” blocks(marked with an exclamation sign), green ones are moving periodically, red blocks retract when touched. You’re likely to meet various enemies as well – spiders or spiked turtles – they won’t kill you but will leave you unconscious for a while – which makes you lose time, which increases the chances you eventually drown.